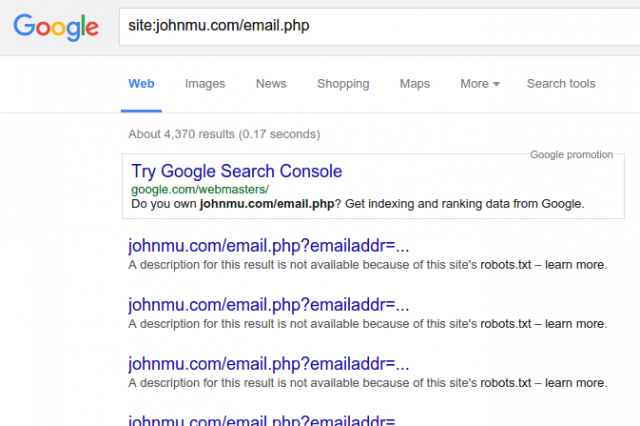 Google's John Mueller shared an insightful how-to post on Google+ on how to discover and then potentially remove email addresses that you accidentally let Google index on your web site. Sometimes, through code issues, Google can discover email addresses you have in your database. It is not that uncommon for this to happen novice webmasters. When it does, it can be an embarrassing thing. John Mueller showed on Google+ how to remove it. For example, you can submit "email.php" to have all URLs that start with / use that script temporarily removed. Hopefully you will never have to use this, but if you do, it may come in handy.